You're in private browsing mode (good work!) and your browser won't be able to save your selections. You'll need to use the 'Share' button and save a copy of the link it generates. or return to your own list by clicking here. 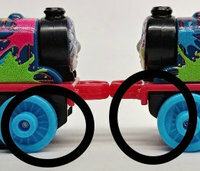 • Numbers refer to the code on the front or back of the blind bags (e.g. H09A/12 is train #12 below) • Numbers in bold vary by region (Japan, NA (North America), or WW (Worldwide)): be sure you click on your region at the top of each wave to get the right numbers. Include blister packs in total. • The "Unnumbered" columns are for engines that are only available in blister packs, not blind bags (yet). As they become available they will be crossed out with their NA blind bag numbers listed, then removed after about a month. • Clicking on names in the multi-packs will highlight that pack's trains in the blind bag list; clicking on "+ N others" will show the detailed list of non-unique trains in those packs. Or you can use the dropdown menus between the blind bag and blister pack tables to highlight trains by engine name or by theme (selecting "Classic" won't highlight any blister packs). Engines will stay highlighted until you use the "Clear highlighting" button. Use the "Select" button in Settings to put checkmarks by all the highlighted engines. • Click on the bold wave titles to collapse or re-expand their contents. • Click on any blind bag train name to show or hide its picture. Thanks to all the contributors at Blue Plastic Tracks and the Thomas Minis Wikia (where most of the pictures came from) and Thomas Wikia Minis page for sharing the data used to create this page! Updated 2019-03-25 (corrected codes for 2019/2 #391, 392; previously: 2019 3-packs).